A big thank you to all of those who came out to last month’s Chocolate Walk! And as spring is finally upon us, there is plenty to look forward to in Uptown Westerville in the coming weeks. 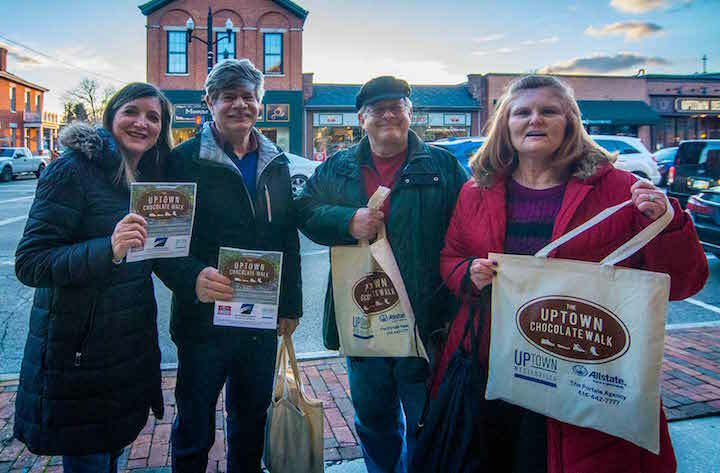 The Uptown Beg Hunt takes place on Saturday, April 8 from 1-4pm. For $3, you and your canine friends can visit many of Uptown’s Merchants for a treat—and all of the proceeds benefit CHA Animal Shelter. Sponsored by Captivating Canines. Fourth Fridays begin on April 28th and will run through September. The theme for this month’s festivity will be Uptown Alive. Join us for food carts, live entertainment, kids’ activities, extended hours in the Uptown shops and much more! The Uptown Farmers Market returns on Wednesday, May 3 from 3-6pm at the corner of North State and Home Streets. *Special thanks to Gary Gardiner for use of the photograph from the Uptown Chocolate Walk!